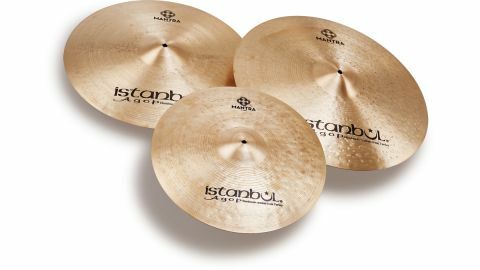 This neat set provides Cindy Blackman-Santana with a jazz-based cymbal retaining that hallmark traditional Istanbul character, but with a sharper, brighter cutting, rocking edge. Cindy Blackman-Santana's Istanbul Signature OM series debuted in 2009. The OMs are more of an out-and-out classic power-jazz set, a nod towards Cindy's great mentor, Tony Williams. Tony was no light hitter, so the OMs had to be compelling, capable of withstanding a good thrashing. But now that Cindy has returned to the gig that made her famous - alongside guitar hero Lenny Kravitz - she felt the need for something sharper and brighter, though not at the expense of losing the darker jazzy side. Hence this new limited series of Mantra cymbals. Istanbul has discontinued the 16" and 20" OM Crashes and 24" OM Ride, while the remaining OMs have a new logo that aligns them with the Mantras. The small set encompasses a 22" ride, 20" crash and 15" hi-hats. They look cool with their four-circle logo, bright golden shine, diverse lathing and multiple hand-hammering. Like all Istanbul cymbals they are manufactured in Turkey using traditional B20 bronze alloy and largely traditional craftsmanship. The ride and crash are 20 percent heavier than the previous OMs, while the hats remain the same medium weight. Also changed, the profile is slightly higher, with enlarged bells, while the finish is polished natural where the OMs have a mottled and blackened vintage finish. While retaining the complex, jazzier side of the OM rides, the 22" Mantra Ride has a brilliant leading edge with a sharp stick response, exactly what you imagine the brief asked for. It cleverly combines its jazz and funk roots with a modern, more sparklingly loud and cutting thrust. The result is the ride will serve you on medium volume jazzy noodles right through to all-out Kravitz style rock-funk blasts. There is power aplenty, so if you do find you need to stoke things up, this ride won't be left trailing and played out. "The ride will serve you on medium volume jazzy noodles right through to all-out Kravitz style rock-funk blasts." This is not a dry cymbal, and underneath the initial stick clarity is a plentiful wash adding much to the rounded presence of the ride tone. Overtones are complex but harmonious, there are no unpleasant long-lasting hums, the cymbal has been expertly hammered to get the maximum body while extracting any discords. This applies whether you play it loud or soft. But this is just the start. Adding to this power, when you crash-ride/shoulder it the crash sound is surprisingly bright. It's a dazzling shimmer with that full-bodied deeper wash filling out the total effect. And then there's the bell. This is a classic solid and clear clanger that means business, but is not stabbing in the unpleasant manner that some HM cymbals have that is actually painful. There is always that darker component warming out the stroke. The dual effect carries over to the 20" Crash which also has a lower warmth and range, but starts with a sharper and livelier slicing edge. It's pretty fast for a 20", opens up easily, blooms luxuriously with a full rich whoosh. Just like the ride you can listen closely as it dies away and never wince at some unexpected and unharmonious overtone spoiling the purity of the decay. As ever these days we find ourselves riding on it and playing the bell. More than ever it is worth remembering 'crash' is just a convenient label and a quality cymbal like this can be put to many musical uses. We enjoyed the hi-hats too. And having not played a 15" pair for a while there is a lot to be said for this size. They are not too big to handle, nor too heavy, they are still plenty quick enough, but they have a bit of extra heft. There's a softer and darker feel to them (being thinner) than the other two in the series, yet they sit in there comfortably enough. Because of the extra diameter and the medium weight, played closed they have a subtly subdued and husky tone with less of the stick prominence of the ride. But as you progressively lay in and use the shoulder they produce a thicker and meatier beat that drives from underneath rather than screeches over the top.